The thought should be pondered: Will God remove the agency of one of His leaders? If someone is called of God, can they err and lead us astray? Joseph Smith seemed to be warning the church about this when he referenced Ezekiel 14. President Joseph Smith read the 14th chapter of Ezekiel — said the Lord had declared by the Prophet, that the people should each one stand for himself, and depend on no man or men in that state of corruption of the Jewish church — that righteous persons could only deliver their own souls — applied it to the present state of the Church of Jesus Christ of Latter-day Saints — said if the people departed from the Lord, they must fall — that they were depending on the Prophet, hence were darkened in their minds, in consequence of neglecting the duties devolving upon themselves, envious towards the innocent, while they afflict the virtuous with their shafts of envy (Teachings of the Prophet Joseph Smith, p. 237). What was “that state of corruption in the Jewish church?” Were they looking to the arm of flesh, their leaders, as their idols? Have we turned the prophets into idols? To think that God will remove their agency, or ability to lead us astray, is really no different than what Satan was proposing. In one case you’re claiming God will nullify a prophets agency and their ability to lead us astray, thus their followers are all saved; and in the other, the followers of Satan have their agency nullified, therefore they are all saved. 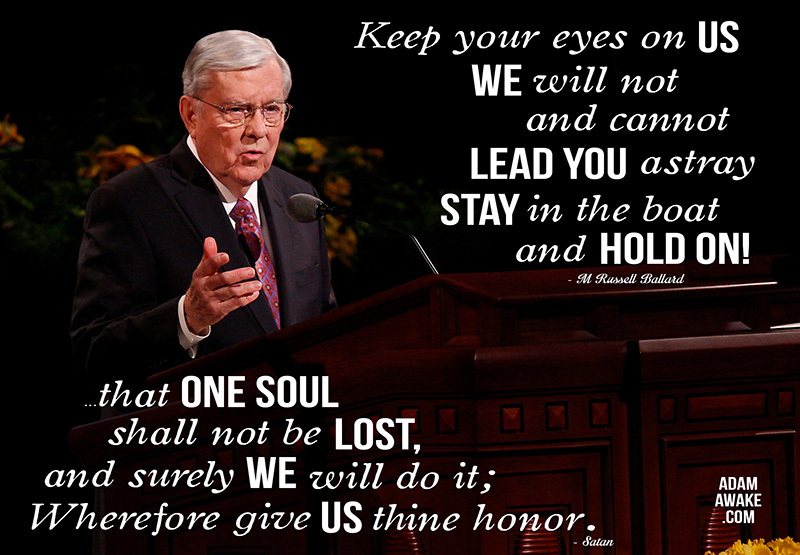 The quote in the meme above is from the talk, Stay in the Boat and Hold On! It is compared with a verse from the Pearl of Great Price, Moses 4:1. You should ponder the similarities. 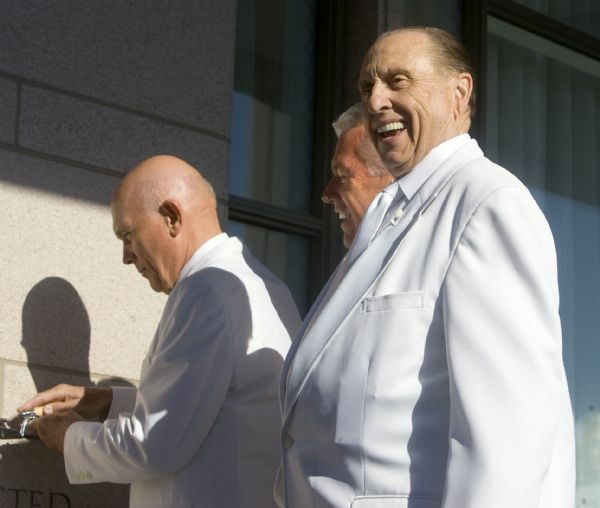 Ironically, the scriptures gives us scenarios in which God will “cease to be God,” (Mormon 9:15,19) (Alma 42:13,22,25) yet somehow the brethren will not “cease to be God.” Well, they aren’t really God, but most members speak of them this way by saying that the church (the Lord) and it’s leaders (the Lord) can’t do us wrong. Therefore they might as well be God, because they can’t do wrong, and everything they say is inspired. Can you say Idolatry? Is there scriptural precedent for a true prophet leading someone astray? Have you read 1 Kings 13? I would suggest you study it over with the Inspired Version or the JST. Even if you decide it’s a good thing to follow a prophet, just know that even following true prophets will only land you a seat in the Telestial kingdom. For these are they who are of Paul, and of Apollos, and of Cephas. Perhaps we need to stop trusting in the arm of flesh. Seek the Lord.